The photo in the above right is the look out spot in Tropea. It looks over the crystal clear blue ocean. You can see nothing but ocean and powder white sand for miles and miles. The water is so blue that I swear you could see the little fish swimming in the water below if you looked hard enough. 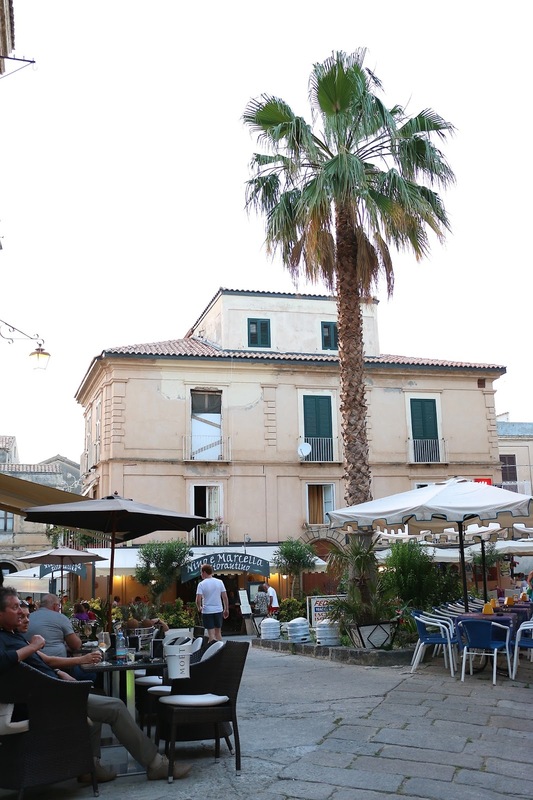 You can get a better idea of what I was in awe of in my Tropea video HERE. We strolled through the cobble stone town for a little while before dinner because we weren’t quite ready to devour a big pasta meal. We had been snacking on the treats our hotel was giving out and kind of spoiled our dinner almost every night. Who can resist cookies and chocolates that are brought to your balcony before dinner! We sure couldn’t. This was another look out point a little closer to our hotel. On the far right you can see the edge of a restaurant that looks over the water and church in Tropea. I know I’ve said it a hundred times but I really had the most amazing time in Tropea. It was small enough that it makes a good weekend getaway, it’s not too touristy, it’s full of great food and amazing people. And the top it all of, the beaches were stunning. We were told we were there at a good time (we were there in June) and that it does get busy in July and August, so keep that in mind if you plan to visit. I hope you enjoyed these posts from Italy! I love being able to look back on the trip of a lifetime.